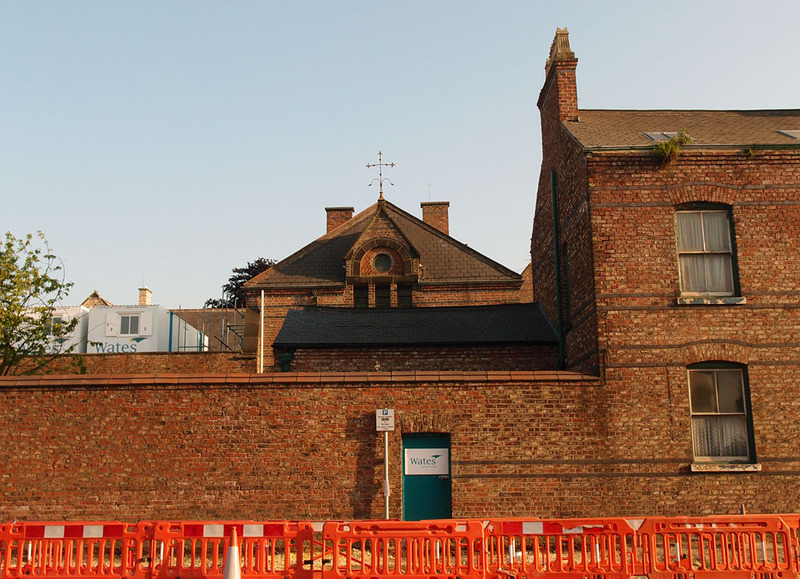 Back in autumn 2004, on one of my ‘York Walks’, I wandered down Lawrence Street, past the Poor Clares convent. I didn’t know it was there, until I was out with the camera, taking notice, and noticed the signs at its entrance. And then noticed the beautiful effect of the autumn sunlight through an open gateway, with the convent’s buildings beyond, behind a high wall. I took only these two photos above, and continued my walk back towards town. 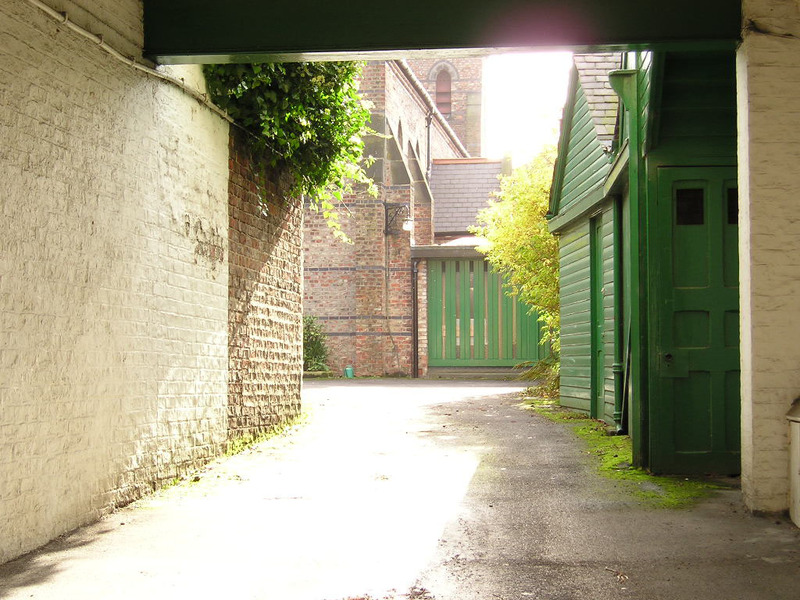 I liked the idea of that quiet sunlit space behind the wall, the glimpse I’d had of it, its seclusion and peace, cut off from the nearby busy traffic of Lawrence Street. It was reassuring that it existed, a convent, behind a high wall. But that was the old York. 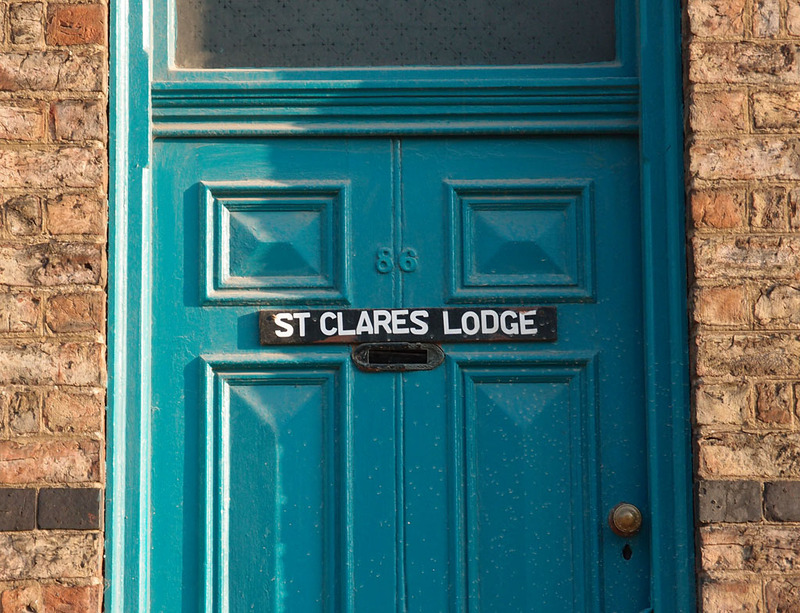 As mentioned in a page last April, in recent years the nuns moved to smaller premises, and a planning application for student accommodation on the site was approved. This is now under construction, and has been for some time. But some of the old hand-painted signs are still hanging on in there in that doorway, reflected in angled mirrors and joined by the typical building site signs. The high wall is still there, but from the opposite side of the road we can see the upper parts of older buildings within it. 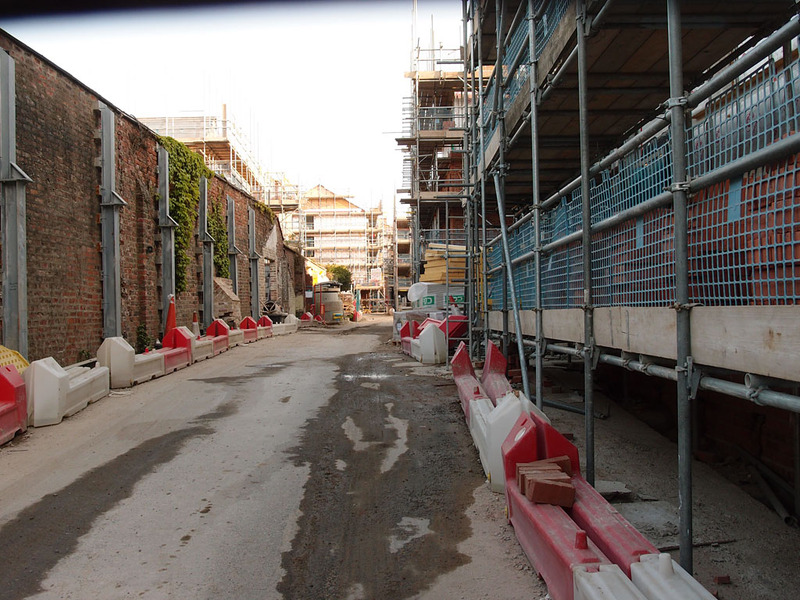 These are being retained, with newer blocks built alongside. 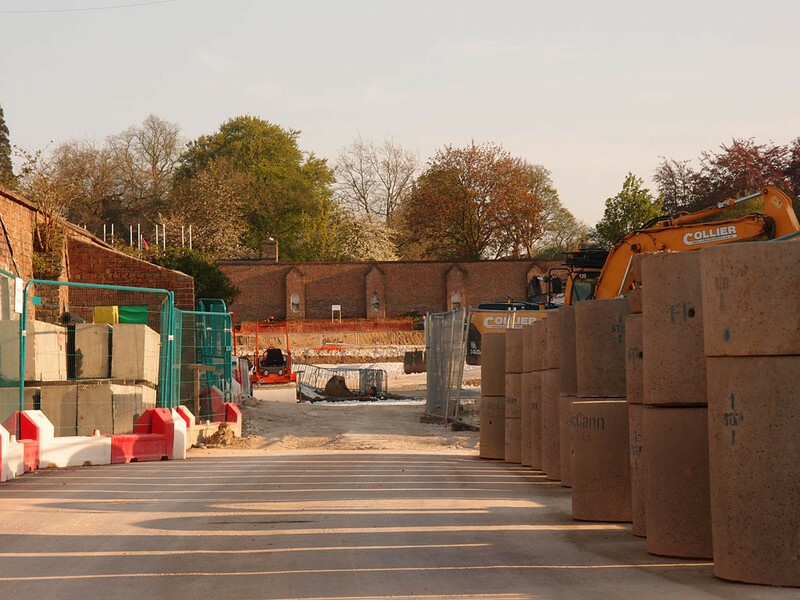 Though there’s a high wall surrounding the site and the usual gating and fencing that building sites have, the gates in the main site entrance have a handy gap, big enough to allow a glimpse of the land within, and the progress of work on the site. I passed by one evening in early May last year, when work had begun, and thought it would be interesting to revisit one evening a year on to see how things had changed. In May 2016 the gap in the gate revealed the extent of the site, which I’d not fully appreciated before. The wall in the distance must be one of its boundaries. What’s most obvious is the contrast between the openness and sunlight in the 2016 photo and the relative gloom in the 2017 photo. The weather conditions were very similar – I made a point of revisiting on an equally sunny evening, and at around the same time. The difference in light levels is of course because of the huge block under construction on the right of the photo. Whether this is bigger/taller than what was here before I don’t know, but I expect it is. I didn’t know much about the planning application that resulted in the current work on the site, but application 14/02404/FULM seems to be the main one, and the associated 14/02405/LBC. Minutes of the meeting during which these plans were discussed and approved (19 Feb 2015) can be found on this link. 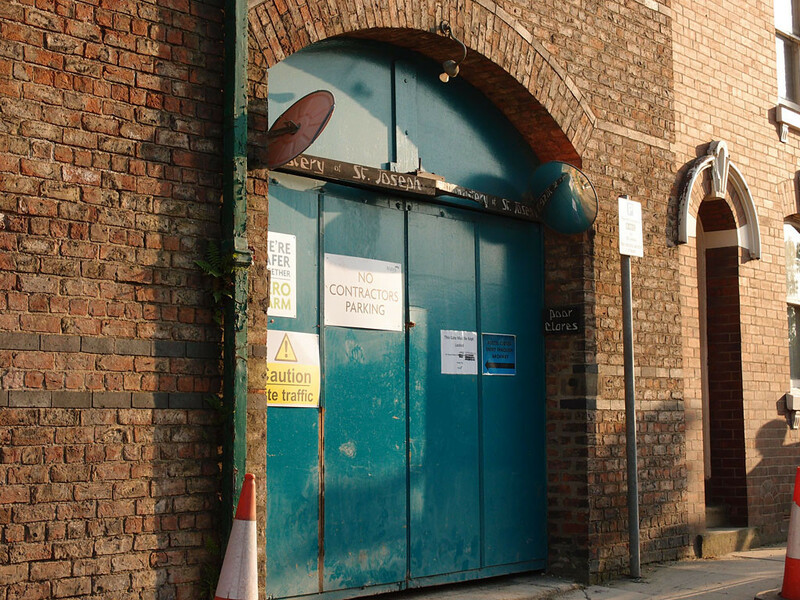 The relevant committee report is on this link (PDF) and is worth reading for information on the history of the site, the planned buildings now under construction, and comments made in response. 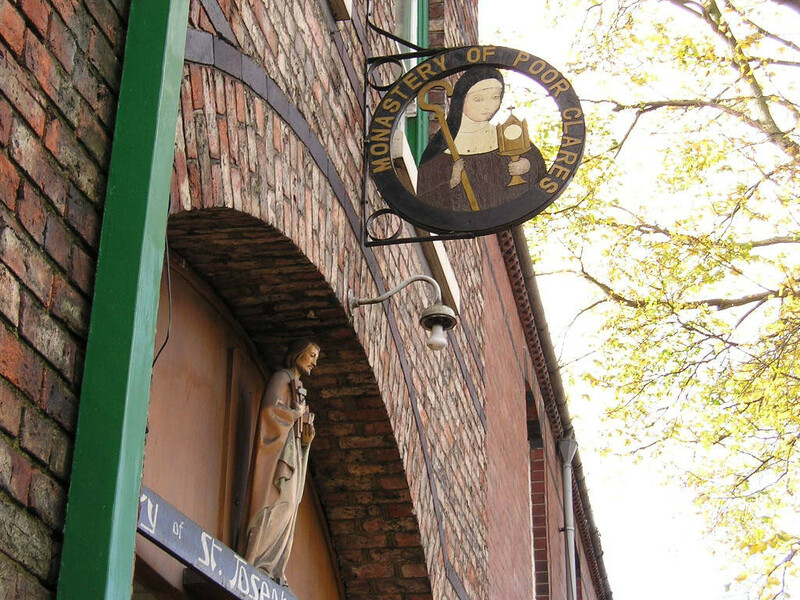 (There’s also a long list of associated planning applications relating to changes and details, which can be found via the search term ‘St Josephs Convent Of Poor Clare Collentines’ at https://planningaccess.york.gov.uk/online-applications/.) There’s also a map/plan of the site on this link (PDF). 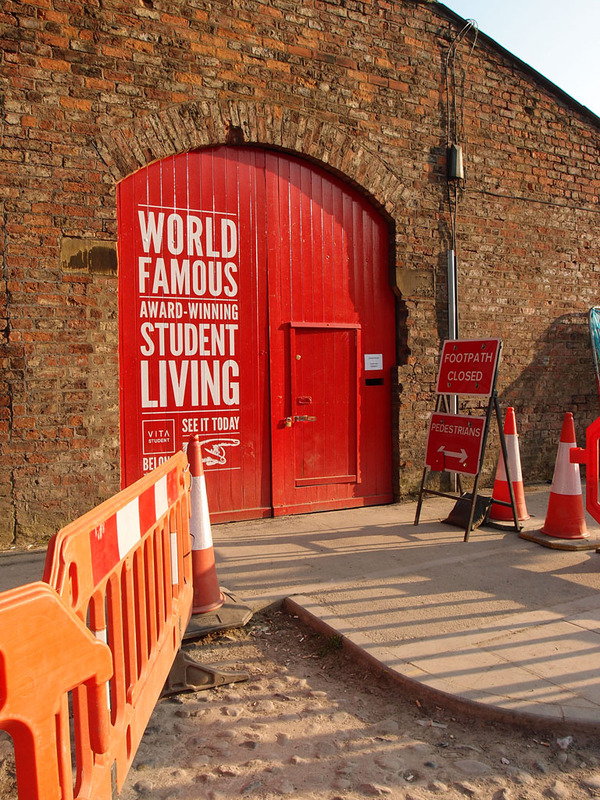 There would be an over-concentration of student accommodation along the Hull Road/Lawrence Street/Walmgate corridor. Many period buildings in the area have been lost and replaced with anonymous modern blocks of flats which show no respect for the scale, setting and character of the area. It is considered this scheme is also over-development. 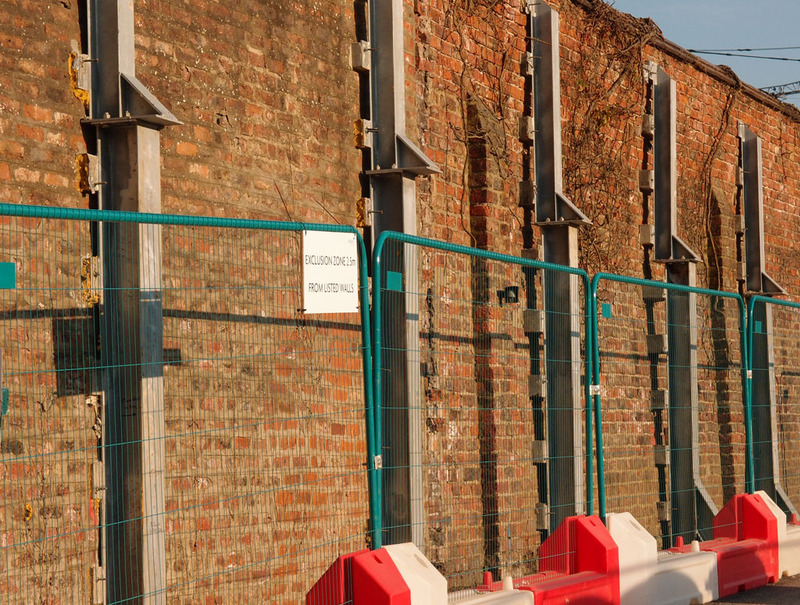 The Convent site is over twice as big as any other student accommodation site developed in the last 12 years along the A1079 corridor, its affect on the locale will be horrendous. Let’s hope that it isn’t as horrendous as feared. I’ll end this page with a couple more photos taken on my recent visit (25 May). The brief piece I wrote last April provoked some memories of the convent, added in the comments (see this link). This ‘resident’s record of York and its changes’ has been online for many years. I’ve been adding to it weekly in recent months. This may be changing to fortnightly over the summer. If you appreciate what’s here (see the archives for more) and would like to support it, you can buy me a coffee, via the button below. Your appreciation is always appreciated. See my ko-fi page for more information. (via ko-fi.com. “Ko-fi helps creators get support from people who love what they do”). 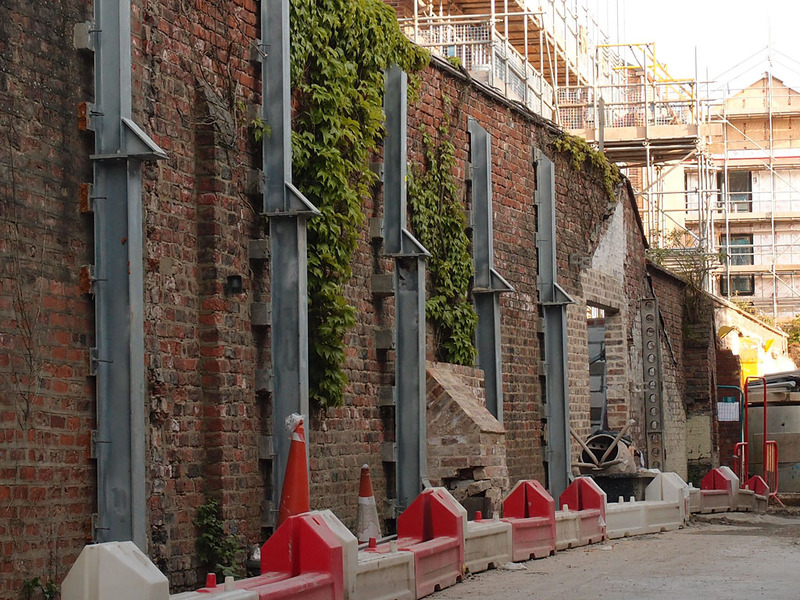 By Lisa @YorkStories • 30 May 2017 Buildings, Changes To link to this page's proper location please use the > permalink. 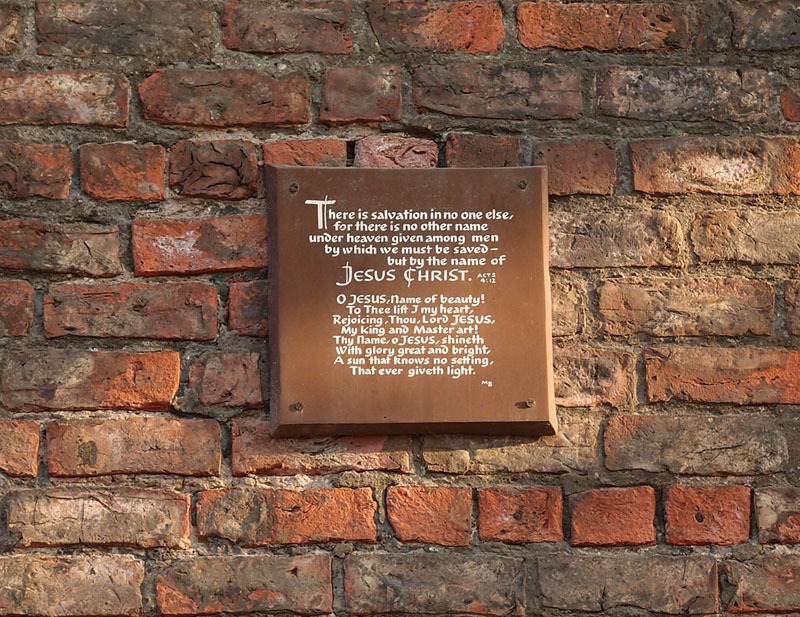 I was surprised by the picture of the brown plaque on the wall. I have driven along Lawrence Street many times and not noticed it. I believe I have walked past on occasions as well and not seen it. I always enjoy your articles, you have the ability to see things that I walk past and fail to see. This order of nuns are now living in Askham Bryan in a lovely big old house.